Klingenberg, January 2019, Integrative pressure measurement in the smallest of spaces: WIKA has expanded its portfolio for OEM applications with the very compact MPR-1 piezo sensor module with standardised output signal. 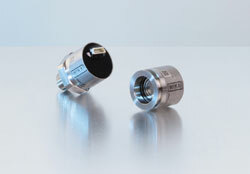 With a diameter of 19 mm and a height starting from 17 mm (depending on the process connection), the sensor module can be integrated into a wide variety of products and systems. The custom-fit specification is supported by the selection of analogue and digital output signals. The version with digital I²C signal features very low power consumption and a fast response time (3 ms). It is therefore ideal for applications with battery operation. In addition, a temperature value can be output via the I²C signal. The model MPR-1 is available, as standard, with gauge and absolute pressure measuring ranges (from 0 ... 0.4 bar to 0 ... 25 bar) as well as vacuum measuring ranges. It measures with an accuracy of ≤ ±0.5 % of the span. On request, a higher accuracy and other pressure ranges can be realised.